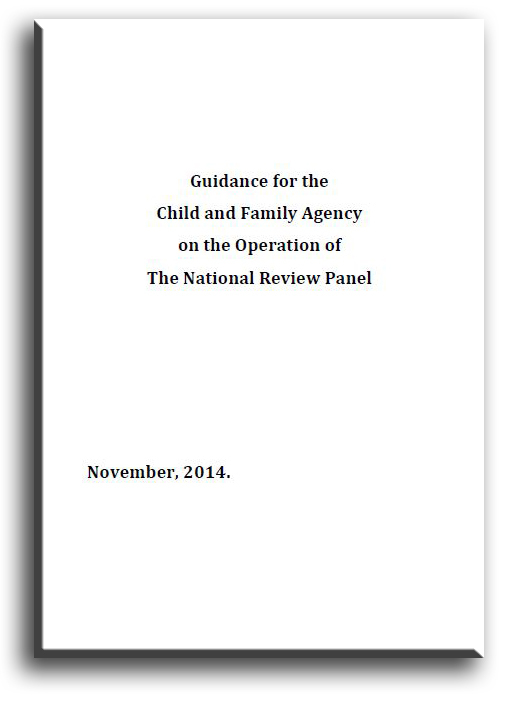 The National Review Panel (NRP) is commissioned by Tusla, the Child and Family Agency, but is functionally independent. Its purpose is to conduct reviews of child deaths and serious incidents and produce reports that are factually based and identify points of learning with a view to improving the quality of services provided to children and families. The panel consists of independent professionals from a range of disciplines who are engaged for their professional expertise. Reviews are conducted under guidance which was most recently revised in November 2014. The process operated by the NRP normally consists of a review of all records held by social work departments and professionals from other services who have worked with the child and family as well submissions from stakeholders, interviews with staff and family members, followed by the production of a report. In certain cases, the process consists of a desktop review, i.e. a review of records only. Where appropriate, a composite review will be written which will include a number of cases with similar themes. Deaths of young adults (up to 21 years of age) who were in the care of the Tusla in the period immediately prior to their 18th birthday or were in receipt of aftercare services under Section 45 of the Child Care Act, 1991. The frequency of a particular type of case exceeds normal levels of occurence. Completed reviews are submitted to the Chair of Tusla. The decision on whether and how much of the report is to be published rests with the Child & Family Agency. The focus of publication is to ensure that the reports are available to the public; the dissemination of learning to staff and to ensure that progress in relation to recommendations made are monitored and reported upon to the Board of Tusla. The decision to publish is underpinned by a number of principles including, transparency and accountability, the wishes of the family/individuals involved and consideration of the wishes and best interest of other children from the family who may be in care or living at home. Any decision taken to not publish a report is only taken where there are compelling reasons not to do so such as legal/criminal proceedings or where the report will adversely affect the well-being of those involved and/or family members or other members of the community. You can contact the NRP at the address and phone number below.